Caison bridges two estranged narratives: Southern Literary Studies and Native American Literary Studies, and tells a new – and very old – story that matters. The result is “Red States: Indigeneity, Settler Colonialism, and Southern Studies,” Caison’s recently published book, which she started in 2009. Caison, a North Carolina native, grew up in a town that is Occaneechi-Saponi territory and was inspired in undergrad by the people she grew up with and a novel titled “Green Grass, Running Water” by Thomas King, a Cherokee author. Realizing there was a different context in Alabama, Caison became interested in Indigenous and Southern issues. And many of those from the South — and even those not from the South — know the word prompting centuries of anxiety: land. As colonialism raided the South, the idea of land seldom resulted in anything but warring and removal of Indigenous people. Hungry land-grabs consume most of the South’s past, and in turn, eats the most white-space in history texts. Southern Literary Studies shifts between pre- and post-Civil War dates, which often overlooks groups of Native writers. “I wanted to shift the focus on Southern Literary Studies away from this obsessive look at the Civil War and say, ‘What happens if we center around the Indian Removal Act and Indigenous Removal in the Southeast?’ and see how both Native and non-Native writers are talking about that,” Caison said. 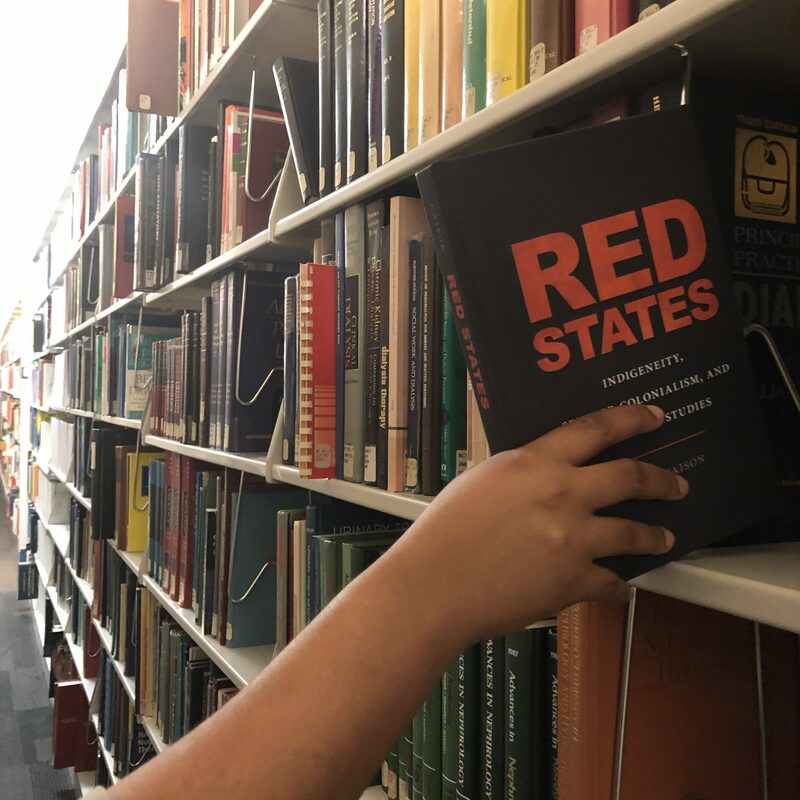 The title Red States nods at the modern idea of conservative states and the history of the Red Power movement, which was an Indigenous resistance power movement out of the ‘60s. I-85, the Southeast’s most loved (and hated) interstate, has Indigenous roots. I-85 follows the Great Trading Path from North Carolina, established by Southeastern Native people. “Red States” tells narratives from Indigenous history to the contemporary, largely in the Southeast. It works chronologically from 1587 to today with a historical event jumpstarting each chapter. The first chapter, ‘Recovery,’ details the lost colony of Roanoke Island and the recovery of Indigenous stories, setting the tone for Red States. Scholarly emphasis on archives has its limitations. Many authors, though they may believe the stories they tell themselves, are not always accurate. Yet, the combination of archival research and words from living Native communities provided a more comprehensive narrative. Often, stories of Native removal have been simplified and don’t accurately portray Native removal from colonization. Many of the Chickasaw have made efforts to buy back land in Mississippi. Tribes have made both national and individual efforts in present-day Oklahoma to do the same. With Sharice Davids and Deb Haaland as the first Native American women recently elected to congress, Native influence in politics may shape the stories Red States begin telling. After reading this article, I have noticed that folks who publish such articles on the topic of “Native Americans,” as well as folks who post comments with rare exception that all ignore the elephant in the room that as of the passage of the Indian Citizenship Act of 1924, they are U.S./State citizens. Period.